A Diamond Select Toys Release! Sweet Christmas! Start next year's X-Mas list early, and be sure to include this diorama of Luke Cage based on his popular Netflix television series! 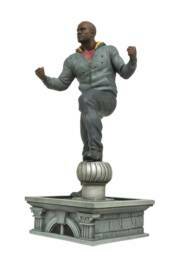 Featuring the likeness of actor Mike Colter, this diorama places him atop a Harlem rooftop, ready to protect his neighborhood from those who would prey on it. This PVC Diorama measures approximately 10 inches tall and features detailed sculpting and paint applications. Packaged in a full-color window box. Sculpted by Rocco Tartamella! MARVEL MINIMATES SERIES 77 ASST. MARVEL RISING FASHION DOLL WAVE 1 ASST.